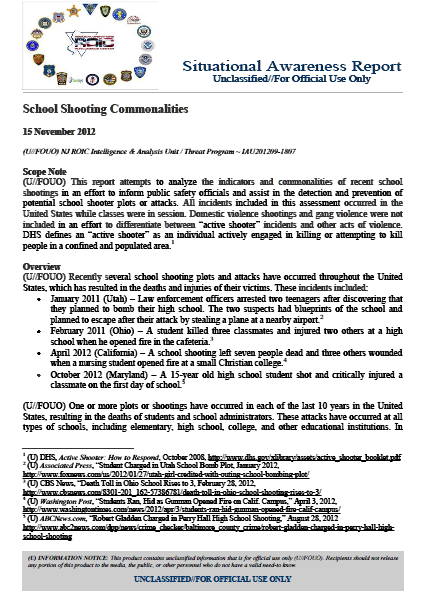 (U//FOUO) This report attempts to analyze the indicators and commonalities of recent school shootings in an effort to inform public safety officials and assist in the detection and prevention of potential school shooter plots or attacks. All incidents included in this assessment occurred in the United States while classes were in session. Domestic violence shootings and gang violence were not included in an effort to differentiate between “active shooter” incidents and other acts of violence. DHS defines an “active shooter” as an individual actively engaged in killing or attempting to kill people in a confined and populated area. January 2011 (Utah) – Law enforcement officers arrested two teenagers after discovering that they planned to bomb their high school. The two suspects had blueprints of the school and planned to escape after their attack by stealing a plane at a nearby airport. February 2011 (Ohio) – A student killed three classmates and injured two others at a high school when he opened fire in the cafeteria. April 2012 (California) – A school shooting left seven people dead and three others wounded when a nursing student opened fire at a small Christian college. October 2012 (Maryland) – A 15-year old high school student shot and critically injured a classmate on the first day of school. (U//FOUO) One or more plots or shootings have occurred in each of the last 10 years in the United States, resulting in the deaths of students and school administrators. These attacks have occurred at all types of schools, including elementary, high school, college, and other educational institutions. In every instance of a school shooting attack in the United States during this period, the attacker has used small arms or homemade explosives. (U//FOUO) In the past several years, the majority of students who have conducted plots or attacks against their schools have publicized their anger or intentions through the use of social media. Not every instance of expression of anger will necessarily result in violence, but when school shootings have occurred, the perpetrators have often previously expressed a fixation with death or inflicting pain on others. (U//FOUO) While students have used social media to express their anger and intentions to attack their schools, this type of action is neither new nor limited to online activity. Even without the use of online media, students have expressed their frustration and intentions through other outlets by using handwritten journals, notes, and drawings. These documents can indicate pre-operational planning, as illustrated in the 1999 Columbine shooting. Diary entries of the Columbine shooters, released in 2006, not only contained their anger but also reminders to fill ammunition clips and acquire bomb-making materials, including nails, propane, and fuses. January 2011 (Nebraska) – A high school student who shot one administrator and killed another posted ominous messages on his Facebook page that read., “You’re gonna hear about the evil [expletive] I did but that [expletive] school drove me to this. I want you guys to remember me for who I was before this. I greatly affected the lives of the families ruined but I’m sorry. Goodbye.” These attacks occurred despite the existence of these postings because friends or family were unaware of these writings until law enforcement investigated the shootings and searched the students’ computers. In 2012 law enforcement officers arrested several students after they posted threatening language online. In one instance, in January 2012, two students were arrested for planning to bomb their school after one of them shared their plans with another student, who then informed school officials. When questioned by law enforcement, one of the students stated that not only was the 1999 Columbine High School shooting their inspiration, but also that they hoped to surpass its death toll. This instance and several others in which a concerned student or parent informed the local police department, preventing the attack, demonstrate the importance of reporting suspicious activities. (U//FOUO) While social media has provided students with a venue to post their anger and intent, the Internet can also provide them with access to violent web sites. Violent online material has the potential to influence an already emotionally troubled student producing sometimes negative and deadly consequences. In 2005 a 16-year old, who posed messages on a neo-Nazi website calling himself the Angel of Death, killed nine people and wounded seven before committing suicide. Some online material can also provide instructions on weapons use and bomb construction. (U//FOUO) In the last 10 years, male students have been responsible for the majority of school shootings nationwide. Students who perpetrated attacks were also more likely to know their intended targets rather than to attack their victims randomly. When students targeted an administrator, they believed that either the school failed to protect them from bullies, or the student felt school officials unfairly reprimanded them. (U//FOUO) The remaining attackers were outsiders with no relationship to the school or school employees who attacked their supervisors because of employment disputes. One instance of a school employee attacking a school occurred in March 2012, when hours after a teacher was fired, he returned to school and shot dead a school administrator prior to committing suicide. Outsider shooters with no relation to the school, on the other hand, are more likely to attack their victims randomly because these attackers had no discernible association with the school and had no grievances with any potential victims. (U//FOUO) In 2006, two separate outsider attackers shared similar tactics, one at Platte Canyon High School in Colorado in September, and another at an Amish school at Nickel Mines, PA, in October. In both incidents, the gunmen attacked the schools, took several female students hostage, and killed one or more students, before taking their own lives moments before law enforcement officers broke into the classrooms. The threat from outside attackers is not, however, limited to a gunman entering a school. Shooters have also targeted students by waiting outside the school or near the perimeter during recess or at dismissal.